It seems as quickly as it started, it has finished. Caramel month. It has been a busy few weeks as I have navigated my way through caramel in many forms. Crunchy. Creamy. Clear. Sherry Yard has been my chief ‘instructor’, guiding me through the fundamentals of caramel via her book, The Secrets of Baking. This is one of the most frequently referenced tomes in my collection (primarily due to its instructional nature), and has been invaluable in steering me through this syrupy affair. Caramel quite simply starts with cooked sugar. Most professionals use the ‘dry’ method to make caramel – an approach that requires a very good eye to gauge temperature. A more foolproof approach is the ‘wet’ method that incorporates water with the sugar. The addition of corn syrup or lemon in to this mix – which is common in many recipes – also assists in minimising the development of sugar crystallisation. The ideal temperature to cook sugar is roughly between 160-180C (or 325-350F). It quickly can burn, so is essential you watch it the entire time. No multi-tasking! The master caramel recipe of cooked sugar is used to produce crunchy caramel creations – praline, spun sugar, caramel decorations. Add cream, and you have caramel sauce. Add a liquid like wine, juice or water, and you have a caramel glaze. Best of all, with this master caramel formula, you have an indispensable range of recipes at your disposal. Mr Mélanger remarked I must be tiring of caramel. Not at all. Having only scratched the sugary surface of this caramel wonder, my fascination has only just been piqued. But next month is a new theme. And I am excited. Any guesses? Stay tuned! In the meantime, here is a summary of the caramel recipes I tackled during caramel month. I hope you enjoyed some caramel of your own this month, too! This month (with a 3-1 vote by Mélanger readers! ), I will be tackling caramel and exploring what mouth-watering treats I can create with various proportions of sugar and water – plus butter and cream! Creamy or crunchy. Hard or soft. Caramel is a gem in the baking arsenal. Often a well placed decoration in a desert or the all-round star of the show. Either way, its versatility is undeniable. Caramel is loved the world over. But I think I personally know caramel’s #1 fan. It comes in the always effervescent package known as Ms Contreras. At 15, Ms Contreras moved from Chile with her family to Australia. She spoke no English. Quickly, she found herself caught up in the routine of her new life. One such event was a trip to the local supermarket. Ms Contreras thought all her Christmases had come at once when she spied an over-sized jar of caramel. This jar spoke no Spanish, but she just knew it was talking to her. Compelling her to buy it. Needless to say, there was little resistance from Ms Contreras. Once home, she quickly whipped the lid off the container, and with spoon ready, Ms Contreras dipped in without hesitation. As soon as the spoon reached her mouth, alarm bells went off. She may not have been able to read English at this stage, but her taste buds could immediately translate. What she so longingly wanted to taste, was not her beloved caramel at all. Her secret food desire. But in fact, what she tasted was peanut butter. Plain, old peanut butter. With her little 15 year old shoulders slumped, and her spirit broken, she declared – and still does to this day – that to be the worst day of her life. The treats I make during :: Caramel Month :: will never ever make up for that day, but hopefully one or two (that I, of course, will share!) will put a smile on her face. Earlier this year I shared the news of my impending nuptials – and the plan for my French macaron wedding favors. Coordinating with the colours of the wedding (emerald green, aqua and lavender), a wave of flavour suggestions were made. And quickly, my macaron trials were on! But the ultimate winner? Champagne Macarons, bien sûr. Now after all the planning, the big day has arrived. This image is just a sneak peek of day. Mr Mélanger and I are now enjoying our honeymoon. I will return in October and share a few more images of the wedding preparation and the big day. Plus, I will be raring to go with caramel. With a 3-1 vote, it is the clear victor for my next monthly baking theme! Thank you everyone for your choices. Having a serious weakness for chocolate, I was totally surprised with the outcome – but I am really excited about the challenge. Whether an elegant or casual dessert, or simply an afternoon treat, I have re-familiarised myself this month with the fact there is quite simply a pastry for all occasions. I only made a very small selection, but it has been enough to reignite my interest in pastry – and ensure I continue to include a pastry sampling (or two!) in my ongoing baking repertoire. Until then, here is a summary of the basic pastry recipes I tackled during my pastry month, and my selected pastry desserts. 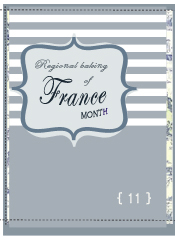 I hope you enjoyed some pastry of your own this month, too! Pâte feuilletée (or puff pastry) is the king of pastry. Light, buttery and decadent. The version by renown chef Jean Millet is outstanding. Puff pastry is time consuming to make, but you are certainly well rewarded for your efforts. The lightest of all the pastries, pâte à choux (or choux pastry) can be transformed into an elegant croquembouche or a simple profiterole or éclair. Julia Child’s timeless recipe for pâte sucrée (or sweet tart pastry) creates a spectacular vehicle for any sweet tart. Crumbly and buttery, pâte sablée is melt-in-your-mouth good. This rich, sweet pastry has a delicate crisp and crumbly texture that seems to enhance the depth of any filling. The most basic of pastry. An all-round baking basic.